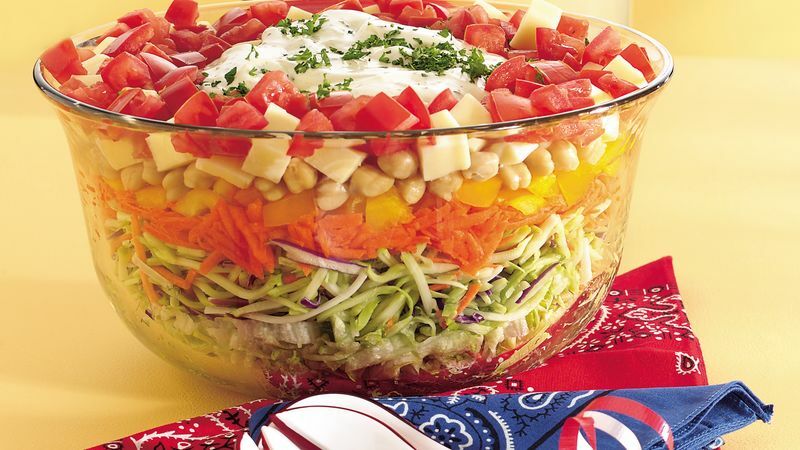 In 5- to 6-quart clear glass or plastic bowl, layer lettuce, broccoli slaw mix, carrots, bell pepper, beans, cheese and tomatoes. In small bowl, mix mayonnaise, dressing and Italian seasoning. Spread over top of salad. Sprinkle with parsley. Serve immediately, or cover and refrigerate up to 8 hours before serving. If desired, toss before serving. Look for the lettuce, broccoli slaw mix and shredded carrots in bags in the produce department. These great time-saving products plus precut cubes of cheese help make this salad super quick and easy to put together.